I know. It’s a fruit cake. So what. 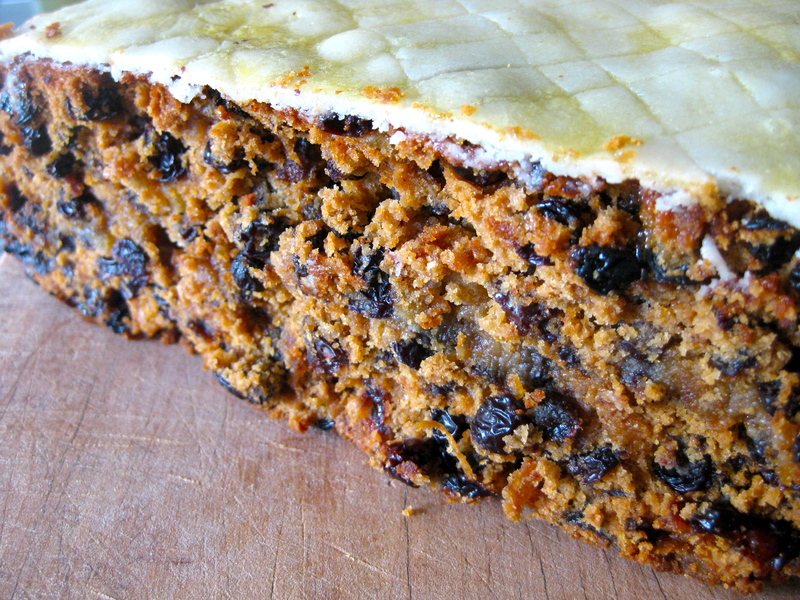 But, I just thought I’d share this recipe for Simnel Cake (not JUST fruit cake) as I have never heard of it before and it’s really very nice. It’s apparently an Easter tradition (or a Mother’s Day Tradition – depending on the citation) here in the UK that originates from the middle ages. I tried it for the first time while sampling the latest Harrod’s Easter goodies for Foodepedia, and eating the baby Simnel cake they sent was just a heavenly moment. I’m not the biggest fan of fruit cake. I’ll eat it as a last resort but really, I’m not that fussed. That’s why I was so surprised at how much I really loved Simnel Cake. It is essentially a fruit cake, but it also has a layer of marzipan in the middle which adds that little extra something. I’m also not a fan of marzipan either. So I just don’t understand why I loved this cake so much. Perhaps it’s just the almond essence that I hate so much – that strange, synthetic flavour that reminds me of medicine. And the Harrod’s cake didn’t taste of this either. Which is why I recommend going the distance and making your own marzipan, because I didn’t and I wish I had. I would also leave out the almond essence, so you’re left with the moistness of the marzipan but not the weird after taste. There’s no waiting around for this cake, no soaking, no fuss really. Just thrw all the stuff together and bung it in a slow oven. I also think 3.5 hrs (as recommended in the recipe) is a little too long, so go with your nose on this one. 1. First make the marzipan. Sift the icing sugar into a bowl, then add the ground almonds, eggs, lemon juice and almond extract to taste. Divide into 3 pieces and wrap each one tightly in clingfilm until ready to use. 2. Prepare a cake tin. 3. Put dry ingredients in a bowl and mix. 4. In another bowl cream the butter, sugar and black treacle or molasses until very light and fluffy. Add the eggs one at a time, sprinkling in a little of the sifted flour and beating well after each addition. Stir in the remaining flour, then the fruit, peel, zest, juice and ground almonds. Add the milk and mix until all the ingredients are well combined. 5. Roll out one of the pieces of marzipan into a 20cm disc. Put half the cake mixture into the tin, and cover it with this circle of marzipan, pouring the rest of the cake mixture on top. 6. Bake in the oven for about 3½ hours, or until a skewer inserted comes out clean. The top of the cake should be dull, not shiny. 7. When the cake is completely cooled, brush the top with a little warmed jam, sieved if necessary. Roll out another ball of marzipan and place it on top of the cake, pressing it down well. Score the top in a cross-hatch pattern. Brush with egg wash and place under grill to toast. If you’re feeling religious or patient, you can roll the remaining marzipan into 11 balls and place on top of the cake. Apparently the balls represent the disciples of Jesus, but this is debated. I had no luck toasting my marzipan so take care there…I’m sure it would be just fine without marzipan or without toasting the marzipan – just don’t brush on the egg wash.
Cheated a bit and made this for Easter and the family loved it, along with our usual New York Style Crumb Cake. Both were incredibly well received by my nephews! I was worried the Simnel cake would come out dry but surprisingly it wasn’t Highly recommend it for a mothers day treat! Oh gosh I remember this cake from my childhood in UK. I laughed about your dislike of marzipan and your description of the Almond essence. My husband has an aversion to marzipan too, so cakes like Battenburg are completely out of the question. I adore marzipan, so will definitly have to give this a go, plus we both love fruit cake, so I wonder if he will detect the marzipan in it? ?